Cygnus was developed by Orbital ATK as part of NASA's Commercial Orbital Transportation Services program. It serves as one of two commercial suppliers to the International Space Station. NASA helped fund the development of two private cargo ships to ensure redundancy in the event of a failure—something that was ultimately needed in 2014 and 2015 after both suppliers had a launch failure within eight months. The first flight occurred in September 2013. An enhanced version, with a stretched pressurized section and circular UltraFlex solar arrays, began flying in 2015. It is launched by either an Atlas V or Antares rocket, the later developed by Orbital ATK. Once Cygnus rendezvous with the orbiting outpost, it is grappled and "berthed" to an Earth-facing port. After being unloaded of its cargo, trash and other unneeded equipment is packed inside the spacecraft. After a couple months attached to the station, it is unberthed and sent on a fiery destruction over the Pacific Ocean. The Pressurized Cargo module was manufactured by Thales Alenia Space in Turin, Italy. The first four Cygnus spacecraft, the Standard version, had a smaller 18.9-cubic-meter module. The Enhanced version, which started flying in 2015, has a 27-cubic-meter module. The PCM is similar in design to the Multi Purpose Logistics Modules that serviced the International Space Station, albeit smaller. It is attached to the station via a Common Berthing Mechanism at the top of the ship. Once berthed to the space station, the crew enters the spacecraft from the CBM to unload the cargo. The Standard version held up to 2,000 kilograms of supplies, food and experiments. The Enhanced holds between 3,200 and 3,500 kilograms, depending on the launch vehicle used. After the ship is emptied of cargo, it is loaded with trash and other unneeded equipment. Also sometimes located inside are experiments that need to be conducted remotely. An example of this are the SAFFIRE experiments, which study the spread of flames in microgravity. While the experiment is remotely conducted inside a specialized container, as an added safety precaution, it is performed after the spacecrafts ends its cargo mission and is at a safe distance from teh International Space Station. Built by Orbital ATK, the Service Module is based of the company's GEOStar and LEOStar spacecraft buss. It has a mass of 1,800 kilograms. For propulsion, the SM uses the hypergolic propellants hydrazine and nitrogen tetroxide. 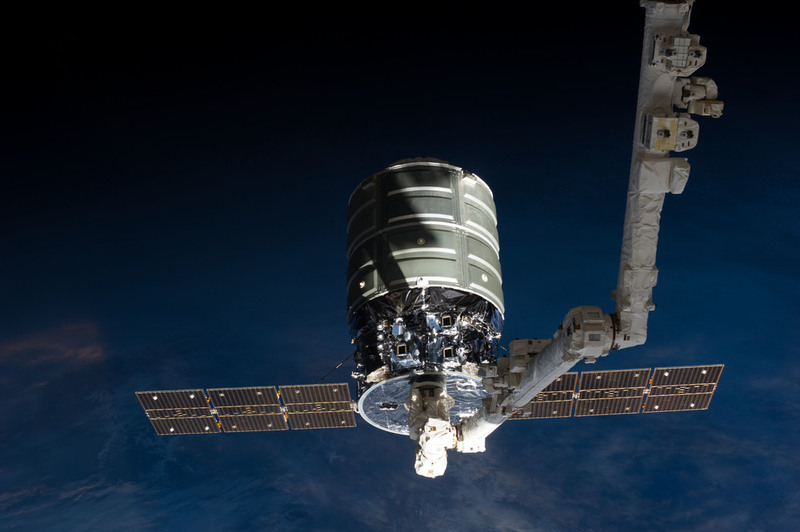 The Standard version of Cygnus utilized two traditional solar panels while the Enhanced version sported Orbital ATK's new circular UltraFlex solar arrays. The new solar arrays provide the same amount of power as the Standard version, 4 kilowatt hours, but with lower mass. At the bottom of the SM is a grapple fixture that allows for the International Space Station's robotic Canadarm2 to attach to during rendezvous and capture operations. Once the arm has a firm grip, it moves Cygnus to one of two Earth-facing ports beneath the space station: either the Harmony module or Unity module. The more recent SMs have had special External Cygnus CubeSat Deployer in order to "launch" up a multitude of CubeSats after the completion of the spacecrafts mission at ISS.